You are living in a land where you can understand the language, but you can’t speak it properly. Whether it’s trying to tell someone you need to use the restroom or asking for a glass of water, you’re having trouble getting your point across. It’s frustrating. It’s the life of a toddler. It’s no wonder toddlers get such a bad rap. Behavioral outbursts are par for the course, partly because of their inability to communicate. The experts we talked to have given us some ideas on how to help. Aggressive Behaviors: Biting, Hitting and Kicking – Oh My! Aggressive behaviors are a normal part of growing up. “This frustration is usually related to the toddler not getting what they want,” says Unruh. Whether it’s biting, hitting or kicking, the experts agree that you have to be firm, tell them they can’t bite and pull them away from the activity. Dr. Brand reminds parents: “You can’t be wishy washy. You’ve got to let them know you mean business.” Jackson takes that a step further: “When you have to say no, you also have to say yes. ‘No, don’t bite on skin, but yes, bite on this.’ ” She suggests putting a rag in the freezer for young children to chew on, as biting can often be a sensory issue, or a need to release anxiety orally. To stop another toddler behavior, whining and screaming, Unruh says parents should “verbally validate” what the child is feeling. “For example, if he is yelling that somebody took his toy, you can intervene first by saying: ‘You must be angry she took your toy.’ ” He says that once they can tell you their emotions, they can handle frustration more appropriately. Jackson suggests a behavior chart with a frown face for whining and a smiley face for positive behaviors. She also says picture books with different facial expressions can help toddlers understand the difference between emotions. If the child becomes destructive or hurts themselves, an option to time out is “time in,” says Jackson. Some children may need to sit right beside their parent until they can calm down and regain self-control. After the time out, welcome your child back to the activity or group and drop the subject. If your child needs several time outs in a row, think about changing the activity. 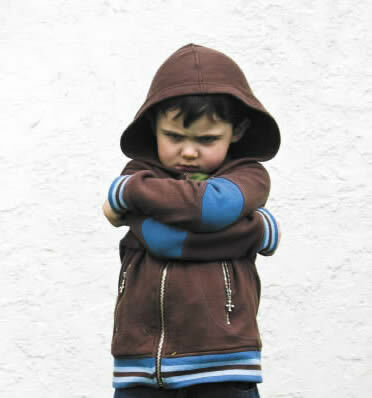 Adjusting your toddler’s attitude may be as simple as adjusting your own. Catch your child doing something right, and praise them for it. The experts advise: Be consistent, follow through and set limits. Regardless of the method, parents need to teach their toddler the reasons for discipline. And remember, this is “just a phase,” and will fade as your toddler’s vocabulary improves.